3M measured the advertising effectiveness of fleet graphics for Cadbury-Schweppes Company using GPS units to track 10 Snapple® trucks through two major metropolitan areas. The three-month study correlated truck routes against zip codes and demographic data to deliver the most accurate measurements of message effectiveness to date. 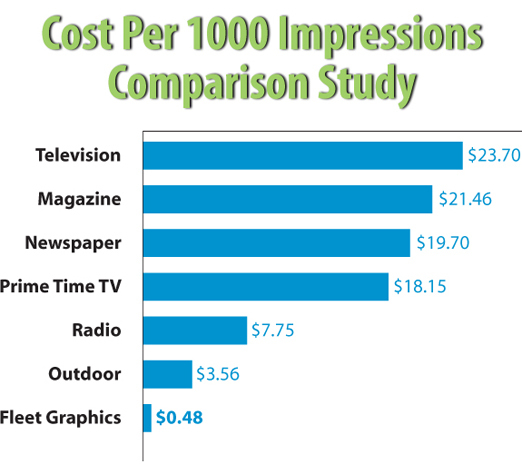 The results show an average cost of $.48 per ONE THOUSAND impressions for Fleet Graphics. Fleet graphics generate a large number of impressions--in this study, an average of 6 million per truck, annualized. Graphics add a valuable dimension to the advertising marketing mix.